When it comes to job opportunities, not all states are created equal. Some states have more jobs available for jobseekers with certain levels of education than others. For example, if you have a master's degree, you may want to consider a move to Delaware, which has more job options available for people with that level of education. If you have a high school diploma, Wyoming may be a better fit for you. In some states, there is an abundance of job options that require a professional or doctoral degree; in other states, the options may be more limited. There may be a high concentration of jobs for people with a high school diploma or less, and a lower concentration of jobs for people with a master's degree. Broadly defined levels of education is just one way to assess a state's job opportunities. It's also very important to consider the specific field in which a jobseeker is trained or educated. This is particularly true for jobs requiring a higher level of education. Industry is also a key factor; workers in certain industries will have more job options and higher earning potential in some states than in others. While there are certainly many factors to consider, it is nonetheless helpful to examine job share by education level, especially for jobseekers considering geographic location and career choice. This article will examine those states which have particularly high concentrations of jobs requiring certain levels of education. Throughout the article, these concentrations of jobs will be reflected in percentages rather than numbers, in order to analyze both heavily populated and less populated states on equal ground. Although the District of Columbia is not a state, this article will analyze it as a state, amounting to 51 in total. The designations used by the BLS also include work experience in a related occupation and on-the-job training. However, this article will only examine education level because it is typically the first requirement set forth by employers for entry-level positions. The following chart illustrates the percentages of jobs nationwide, divided by education level. The vast majority of jobs (84%) fall into three categories: less education than a high school diploma, high school diploma or equivalent, and bachelor’s degree. This national pattern is also found at the state level. In all states, occupations designated at the high school education level constitute the largest percentage of jobs. There is, however, variance from state to state in terms of the specific occupations within each education level. The following sections are organized by education level, and each contain a table showing the 10 states with the highest concentration of jobs in occupations at that education level. The sections also provide examples of the occupations which have higher employment rates in that particular state than they have nationwide. The median annual wages for each education level are also provided. Some states are not included in any of the sections' charts (such as Oregon, North Carolina, Missouri, Georgia, and Arizona). The proportions of jobs by education level in these states are typically quite similar to the nation's as a whole. In the United States, occupations that require less education than a high school diploma constitute roughly 27% of all jobs. At this level of education, the BLS designates 100 distinct occupations. The median annual wage for these jobs is $20,350. The table below illustrates the ten states with the highest concentrations of jobs in these career fields. Source: U.S. Bureau of Labor Statistics (BLS), Occupational Employment Statistics survey (including only employment and wage data) and Employment Projections program (occupational education-level data). "Number of jobs" and "Median annual wage" rounded to nearest hundreds place. Many of the states listed in the table above have high concentrations of jobs in the mining and natural resources industry, which provides many occupations for people with less education than a high school diploma. Other states have thriving hospitality and leisure industries, due to their popularity as vacation or retirement destinations. The hospitality and leisure industry also has many jobs available for people with less education than a high school diploma. Nevada - Of all the states, Nevada has the highest concentration of jobs that usually require less education than a high school diploma or GED, with account for nearly 36 percent of all jobs. Among these careesr are bartenders, ushers, ticket takers, lobby attendants, chauffeurs and taxi drivers. Hawaii - Over 32 percent of all jobs in Hawaii are in occupations that typically require less education training than provided by a high school diploma. These occupations, which have a higher concentration of jobs in Hawaii than nationwide, include cooks, housekeeping cleaners and maids, and parking lot attendants. South Dakota - Occupations that require less education than a high school diploma make up roughly 30% of all jobs in South Dakota. These occupations include meat packers and slaughterers, carpenters' helpers, and agricultural products sorters and graders. Florida - In Florida, almost 30% of all jobs belong to occupations which don't even require a basis high school education. Jobs in this category include amusement and recreation attendants, motion picture projectionists, and groundskeeping workers. New Mexico - Almost 30% of all jobs in the state of New Mexico belong to occupations that don't even require a high school level education. Among these occupations are personal care aides, wellhead pumpers, and derrick operators. Other states - The other states with particularly high concentrations of jobs in occupations which require less education than a GED or high school diploma are: Louisiana, Mississippi, South Carolina, West Virginia, and North Dakota. Career industries varied by state. In North Dakota, for instance, there are more than 20 times the number of oil and gas roustabouts than the national average. This is due to the state's large mining and natural resources industry. In the United States, occupations that require a high school diploma or equivalent education level (GED) constitute roughly 39% of all jobs. 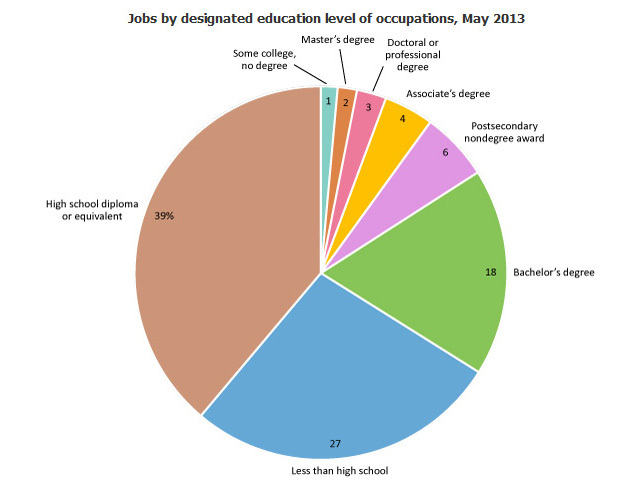 At this level of education, the BLS designates 358 distinct occupations (the most of any level of education). The median annual wage for these jobs is roughly $35,580. The table below illustrates the ten states with the highest concentrations of jobs in these occupations. Many of the states listed in the table above have high concentrations of jobs in the mining and natural resources industry, which provides many occupations for people with a high school diploma or GED. Other states in the table have a large number of workers in manufacturing and other industries. Kentucky - Roughly 42 percent of all jobs in Kentucky are found in occupations that usually need a high school diploma or equivalent level of education. Among these are team assemblers, mining roof bolters, and metal-refining furnace tenders and operators. Alabama - In Alabama, almost 42% of all jobs belong to occupations that usually require a high school diploma or GED. These occupations include industrial machinery mechanics, textile winding, twisting, and drawing out machine setters, tenders, and operators, and plastic and metal layout workers. Wyoming - Approximately 42% of all jobs in the state of Wyoming are in occupations that usually require a high school diploma or GED. Examples include first-line supervisors of construction trades and extraction workers, operating engineers and other construction equipment operators, ordnance handling experts, explosive workers, and blasters. Louisiana - Occupations that usually require a high school diploma or GED constitute roughly 41% of all jobs in the state of Louisiana. These occupations include crane and tower operators, riggers, and chemical plant and system operators. Indiana - In Indiana, over 41% of jobs are in occupations that usually require that workers have completed high school. These include team assemblers, boilermakers, and metal and plastic cutting, punching, and press machine setters, tenders, and operators. Other states - The remaining states with the highest concentrations of jobs in occupations that usually require a high school diploma or GED are: Utah, Wisconsin, Oklahoma, Mississippi, and Kansas. In the United States, occupations that typically require some college but not necessarily a degree constitute approximately 1% of all jobs. At this level of education, the BLS identifies only 5 distinct occupations (the least of any level of education). This education level describes individuals who have a high school diploma or equivalent, and who have completed one or more courses after high school which did not result in a degree, certification, or award. The median annual wage for these jobs is $29,100. The table below illustrates the ten states with the highest concentrations of jobs in these occupations. One occupation played a particularly vital role in the numbers listed above: teacher assistant. At the national level, teacher assistants accounted for 9 out of every 1,000 jobs, compared with higher concentrations in the states listed in the previous table. This level of education has a relatively low median wage, largely due to the fact that teacher assistants typically don't earn a whole lot. Vermont - In Vermont, over 2% of all jobs belong in occupations that usually require a college level education but not a degree. In this state, teacher assistants account for 19 out of every 1,000 jobs. New York - Approximately 2% of all jobs in New York are in occupations that usually require a college level education but not a degree. Teacher assistants account for 14 out of every 1,000 jobs. Kansas - Similar to New York, roughly 2% of all jobs in Kansas are in occupations that usually require a college level education but not a degree. Teacher assistants account for 14 out of every 1,000 jobs. Connecticut - Almost 2% of all jobs in the state of Connecticut are in occupations that usually require a college level education but not a degree. Teacher assistants account for 13 out of every 1,000 jobs. Additionally, Connecticut has a higher concentration of computer user support specialists than the national average. New Jersey - In New Jersey, nearly 2% of all jobs are in occupations that usually require a college level education but not a degree. Teacher assistants account for 13 out of every 1,000 jobs. Other states - The list of states is completed with New Hampshire, Minnesota, Washington, Maine, and Massachusetts. These states have higher concentrations of occupations at this education level than the nation as a whole, and also have relatively high concentrations of teacher assistants. In the United States, occupations that usually require postsecondary education (non-degree) or training constitute approximately 6% of all jobs. At this level of education, the BLS designates 39 distinct occupations. This designation describes individuals who have a high school diploma or equivalent, and who have completed some formal schooling after high school which resulted in a certification, award, or other credential. The median annual wage for these jobs is $35,120. The table below illustrates the ten states with the highest concentrations of jobs in these occupations. One occupation in particular helped the states listed in the table above rise above the rest: heavy and tractor-trailer truck drivers. All ten states listed in the table above have higher numbers of heavy and tractor-trailer truck drivers jobs than the nation as a whole. These states also have relatively high concentrations of certain healthcare occupations that usually require postsecondary education (non-degree) or training. North Dakota - In this state, almost 9% of all jobs are in occupations that require postsecondary education (non-degree) or training. North Dakota has more jobs for heavy and tractor-trailer truck drivers, nursing assistants, and electronic home entertainment equipment installers and repairers, than the national average. Arkansas - Over 8% of all jobs in the state of Arkansas belong in occupations that usually require postsecondary education (non-degree) or training. These include licensed practicel and vocational nurses, embalmers, and heavy and tractor-trailer truck drivers. Nebraska - Occupations that usually require postsecondary education (non-degree) or training account for nearly 8% of all jobs in Nebraska. Examples include nursing assistants, medical transcriptionists, and transportation equipment electrical and electronics installers and repairers. Iowa - In Iowa, approximately 7% of all jobs are in occupations that usually require postsecondary education (non-degree) or training. Among these are heavy and tractor-trailer truck drivers, library technicians, and nursing assistants. Mississippi - Jobs in occupations at this level of education account for over 7% of all jobs in Mississippi. These occupations include licensed vocational and licensed practical nurses, surgical technologists, and ophthalmic medical technicians. Other states - Alabama, Maine, Tennessee, Indiana, and Louisiana complete the list of the states with the highest concentrations of jobs in occupations that usually require postsecondary education (non-degree) or training. Many states on this list have higher concentrations of jobs in the electronics field than the national average. Alabama, for instance, has 3 times more jobs for powerhouse substation and relay electrical and electronics repairers than the nation as a whole. Throughout the country, occupations that usually require an associate's degree constitute approximately 4% of all jobs. At this level of education, the BLS designates 49 distinct occupations. The median annual wage for these jobs is $58,240. The table below illustrates the ten states with the highest concentrations of jobs in these occupations. Several states listed above have particularly high rates of employment in hospitals, which have a wide range of occupations that usually require an associate's degree (such as registered nurses). Massachusetts - In this state, over 5% of all jobs are in career fields that more often than not only require candidates to earn an associates degree. These occupations include dietetic technicians, social science research assistants, and electro-mechanical technicians. Vermont - Approximately 5% of all jobs in the state of Vermont are in occupations that typically require workers to have an associate's. Vermont has high concentrations of such occupations as preschool teachers (except special education), dental hygienists, and respiratory therapy technicians. South Dakota - Roughly 5% of all jobs in South Dakota are in associate’s degree-level occupations. These include nuclear medicine technologists, agricultural and food science technicians, and radiologic technologists. West Virginia - Occupations that usually require an associate's degree account for 5% of all jobs in West Virginia. Examples include funeral service managers, geological and petroleum technicians, and dietetic technicians. Rhode Island - Almost 5% of all jobs in the state of Rhode Island are in occupations that usually require an associate's degree. These occupations include civil engineering technicians, magnetic resonance imaging technologists, and paralegals and legal assistants. Other states - Delaware, Michigan, Ohio, Montana, and Maine round out the list of states with the highest concentrations of jobs in occupations that usually require an associate's degree. Nationwide, roughly 18% of all jobs are in occupations that require a bachelor’s degree. The BLS identifies 166 occupations at this education level. The median annual wage for occupations that require this level of education is $68,190. The states listed above have particularly high concentrations of jobs in the insurance and finance industry, and in the technical, scientific, and professional services industry. Both of these industries have more occupations that typically require a bachelor’s degree than most other industries. District of Columbia - The highest number of occupations that usually require a bachelor’s degree is found in the nation's capital, the District of Columbia. Over 32% of all jobs in the city are in occupations that require a bachelor’s degree. Among these are management analysts, reporters and correspondents, and public relations specialists. Massachusetts - In this state, almost 23% of all jobs are in occupations that usually require a bachelor’s degree. Massachusetts has a higher concentration of biomedical engineers, microbiologists, and systems software developers, than the national average. Virginia - Over 22% of all jobs in Virginia are in occupations that require a bachelor’s degree. Examples include nuclear engineers, ship and marine engineers, and information security analysts. Maryland - Occupations that typically require a bachelor’s degree account for roughly 22% of all jobs in the state of Maryland. These occupations include middle school special education teachers, budget analysts, and atmospheric and space scientists. Connecticut - Nearly 22% of all jobs in this state are in bachelor’s degree-level occupations. These include aerospace engineers, marketing managers, and actuaries. Other states - The list of the states with the highest concentrations of jobs in occupations that typically require a bachelor’s degree is completed with Washington, California, Colorado, New York, and Delaware. One notable outlier: New York state employs six times more fashion designers than the nation as a whole. In the United States, approximately 2% of all jobs are in occupations that usually require a master’s degree. The BLS identifies 39 distinct occupations at this level of education. The median annual wage for these jobs is $64,510. This category includes many of the same states which have particularly high concentrations of jobs in occupations that require associate’s, bachelor’s, professional, or doctoral degrees. This is due in large part to the fact that these states have high employment in social assistance industries and government. District of Columbia - Almost 4% of all jobs in the nation's capital are in occupations that usually require a master’s degree. The city has a relatively high number of several professions, including economists, political scientists, and historians, than the nation as a whole. Massachusetts - Occupations that usually require a master’s degree account for nearly 3% of all jobs in the state of Massachusetts. These occupations include statisticians, industrial-organizational psychologists, and healthcare social workers. Vermont - Approximately 3% of all jobs in Vermont are in occupations that require a master’s degree. Examples include nurse midwives, urban and regional planners, and mental health counselors. Maryland - In Maryland, over 2% of all jobs are in occupations where workers are usually required to have a master’s degree. These include mathematicians, statisticians, and epidemiologists. Delaware - Similarly, over 2% of all jobs in Delaware are in occupations that usually require professionals to have a master’s degree. Among these occupations are nurse anesthetists, marriage and family therapists, and urban and regional planners. Other states - Idaho, Maine, New York, Montana, and Rhode Island also have particularly high concentrations of jobs in occupations that typically require a master’s degree. Rhode Island has a higher concentration of librarians, and Maine has a higher concentration of elementary and secondary school education administrators, than is found at the national level. Nationwide, roughly 3% of all jobs are in occupations that usually require workers to have a doctoral degree or first professional degree (such as a law degree or MD). The BLS identifies 64 career fields that typically require a doctoral level education. The median wage for these jobs is roughly $98,000 a year. Many states listed in the table above employ large numbers of workers in the scientific research and development industry. Most occupations in this industry require a doctoral degree. Several states listed above also have particularly high concentrations of postsecondary teachers (an occupation which typically requires a doctoral degree). This is because many of the states have a high number of universities and colleges, compared to the national average. District of Columbia - In the District of Columbia, approximately 8% of all jobs are in careers that usually require a doctoral degree or professional degree. Examples include physicists and college level political science teachers. In addition, the District of Columbia employs almost 11 times more lawyers than the national average. New York - Nearly 4% of all jobs in the state of New York are in occupations that usually require workers to have doctoral degree or professional degree. These occupations include psychiatrists, postsecondary law teachers, judges, magistrates, and magistrate judges. Massachusetts - Careers that usually require a doctoral or professional degree account for roughly 4% of all jobs in the state of Massachusetts. Examples include medical scientists (except epidemiologists), biophysicists and biochemists, and university level architecture teachers. Vermont - Over 3% of all jobs in the Vermont are in occupations that usually require a doctorate or professional level education. Vermont has higher concentrations of general pediatricians, college level environmental science teachers, and veterinarians than the national average. Rhode Island - In this state, more than 3% of all jobs are found in fields that usually require a professional degree or doctorate level education. Occupations in this category include podiatrists, computer and information research scientists, and university level library science teachers. Other states - Other states with high concentrations of jobs in occupations that require a doctoral degree or professional degree include Maryland, Delaware, Connecticut, New Jersey, and Pennsylvania. In Pennsylvania, there are nearly 3 times the concentration of judicial law clerks than there are in most other states. This analysis of state employment by education level presented above draws on several sources of data from the U.S. Bureau of Labor Statistics (BLS). In May 2013, the BLS conducted the Occupational Employment Statistics (OES) Survey, which measured jobs in more than 800 occupations at the local, state, and national levels. Data from this survey was used in this article. The BLS Employment Projections program identifies several factors that are usually required for entering an occupation: education level, work experience in a related occupation, and on-the-job training. For this article's purposes, only the education level was considered. However, other occupational analysis offered by the BLS include data from all of these factors. On-the-Job Training - Many jobs provide workers with on-the-job training. This training may include apprenticeships, internship/residency, short-term, moderate-term, long-term, or none. Related Work Experience - Some occupations require workers to have a certain amount of experience in a related occupation. Working as a teacher, for example, is typically a requirement for becoming a principal. Some occupations, such as computer network and IS managers, accept related work experience as a substitute for formal training or education. In these industries, what you know is more important than where you learned it. Other Occupational Paths - Many occupations have numerous paths to entry. The BLS designates what is typical, or most common, but occupations may accept workers with different levels of experience, training, or education. To illustrate: the BLS designates the occupation of teacher assistant as typically requiring some college but no degree. However, some teacher assistants have a high school diploma, some have an associate’s degree, some have a bachelor’s degree, etc. Employers often prefer to hire applicants with more education than is typical or required. Using data from both the OES survey and the Employment Projections program, occupations with high concentrations of jobs by state were identified on a per state basis.